As of summer, 2018, approximately $250,000 has been spent on the development of the Nutrient Source Inventory. This funding has come from both Lucas County and The City of Toledo. As the project moves into its second phase, an additional $150,000 will be needed to support the technical consulting services necessary for Phase II modeling. The technical services are provided by Civil & Environmental Consultants Inc. 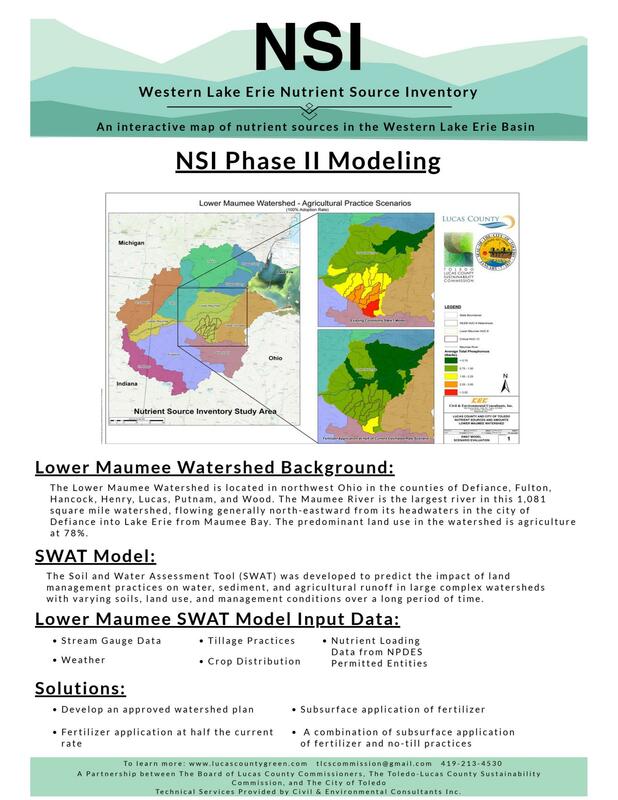 The map was created through a desktop review of available information on nutrient loading which yielded lessons on how to identify and better understand potential primary contributors of nutrients in the watershed. The potential sources that were assessed included National Pollutant Discharge Elimination System permitted facilities, Concentrated Animal Feeding Operations, row crop agriculture, unsewered areas, and permitted biosolid land application areas. Alongside nutrient contributors, nutrient reduction projects and solutions are also taken into consideration when evaluating nutrient loading. These projects and solutions, which highlight water quality and habitat improvements, are funded by government agencies using programs such as the Great Lakes Restoration Initiative. Additionally, the Nutrient Source Inventory includes surface water quality monitoring locations, the nutrient data associated with these monitoring locations, and pertinent public utility infrastructure data where available. This allows the users of the Nutrient Source Inventory to compare the locations of sources with the available water quality data for the receiving streams. The Western Lake Erie Basin covers almost 6 million acres of land, so direct water quality monitoring of the entire basin is financially improbable. In areas with insufficient water quality monitoring data, computer generated models are used to estimate the nutrient loads coming from the sub-basins. Soil & Water Assessment Tool (SWAT) models have been developed where there is enough water quality monitoring data to calibrate the model. The model is useful in showing areas of nutrient loading concern or “hot spots”, which can then be used to determine placement of future water quality monitoring sites, and to identify the appropriate best management practices to reduce future nutrient loading.